Alpha Clone players are welcome in KarmaFleet! KarmaFleet is Goonswarm alliance’s new player corporation. We focus on training new players, giving them the help and resources they need to enjoy this game and be part of something big. We're a nullsec focused corporation who dwell deep in null security space, beyond the reach of the four great Empires, and far from the protection of CONCORD. Together with our allies, we have forged our own Empire which knows no equal. Most of our PVP fleets will involve nullsec or lowsec PVP. As a new player, why join KarmaFleet? KarmaFleet is a full member of Goonswarm Federation, not some separate side-project to dump new players in, where you only get to join in when the self-important main corporation needs a meat-shield. Goonswarm has a long history of taking on new players and getting them flying in the big fleet fights you’ve heard about from day one. That all means you can do whatever you want with KarmaFleet! To help you get started we’ve got Gooniversity, with advice from experienced players in forums and on chat, mentoring, live classes, skillplans with free skillbooks, a wiki full of information, and lots more. Plus of course free PvP ships so you can join in the big fights from day one! We live in the Delve region of nullsec. Jabber text chat for all SIGs & social groups, plus it alerts you when fleets are forming! KarmaFleet welcomes Alpha Clone players too! To find out more visit us online at KarmaFleet.org, on Reddit at /r/KarmaFleet or in-game in our public chat channel, "KF_Public". Or if you’re already convinced, you can put in an application today! KarmaFleet is, of course, still recruiting! Still recruiting, now with added free small gang PvP frigates! I have a terrible name for a recruiter. This is what you get for buying characters... I've considered petitioning my own name as offensive to get it changed! Always take your towel with you. We have a whole university thing setup. We'll teach you all sorts of stuff. PM me if you have any questions. Can you PM on here? Hmm.... mail me in-game or something. Tonight I'm going lots of space paperwork, which Jabber keeps pinging for fleets. Well I did apply to be a recruiter for the corp! Roll on the weekend when I'll have the freedom to log in and play. It's the weekend! I will be able to log in when Jabber pings me about fleets, and fun will be had. Good times. ...and so should you! 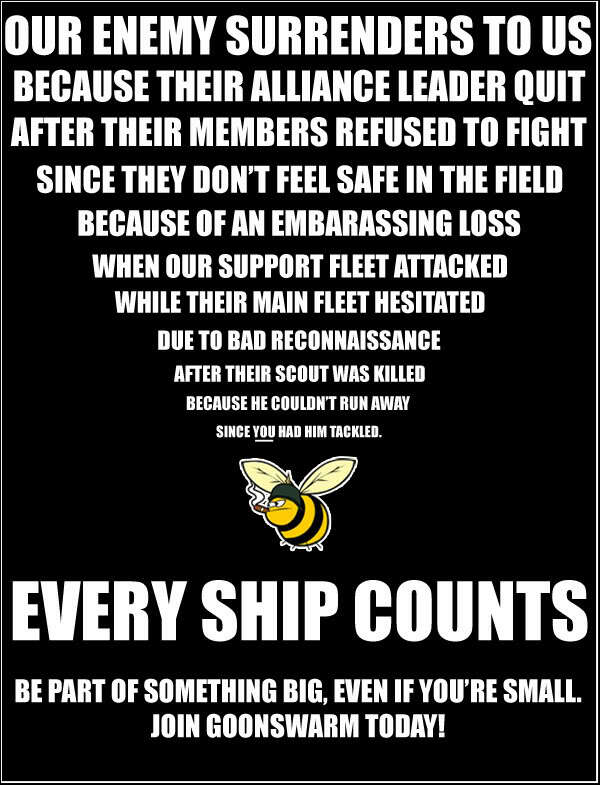 Anyone who joins KF can start running fleets. We've got the guides and mentors to get you started, and people will always love you for creating a reason to log in. We don't mind how many SP you have, and hopefully we'll soon be able to boost that pretty quickly now that Skill Injectors have been released. Plus we've got the resources to help you figure out out the game works. Come and say hello in our in-game chat KF_Public if you want to find out more, there are always a bunch of people in there ready to help.